Back from vacation! I’ll sneak in one of my vacation photographs. 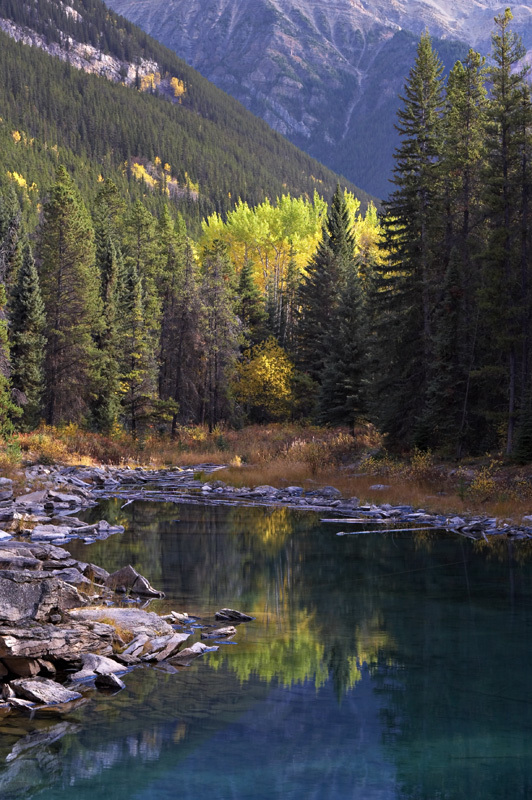 This was taken on October 6 at Horseshoe Lake in Jasper National Park. I understand Ruth’s been busy on BPotD entries in my absence, so we’ll be back to daily entries during the week starting tomorrow! Definitely don’t mind seeing your vacation photos. What an absolutely gorgeous scene! Thanks for sharing it. Welcome back. i am looking forwaid to you come back ! so enjoying with your photo . its my good english teacher . and i can learn a lot of nature by this website . thank you and a lof of peoples very much ! take a good time for relax for long vacation ! Exquisite – I want to be there! I can smell the fresh air. I love the reflection you have captured. Welcome back with your fantastic choice, thanks! I agree this is wonderful especially the colour contrast. By the way are the dark giants Douglas fir and the bright patch birches and larches? Thank you Daniel, and Ruth for keeping us interested. All of your efforts have taught us so much. Especially people like me whose interest is mostly very casual. However, thanks to you, I happened to look up Brazil Nuts on the internet, and was even able to mostly undestand the technical descriptons of the leaves and how they grow and their root systems. Double duty today for you! What a fantastic way to start my day. Wish I could be in Canada in the fall. One of these days I shall. Stunning! Thanks for the share! p.s. yes, I’m still here, still reading the daily posts, still learning, and still enjoying! Daniel, thank you for such a lovely photograph. I could see this quite large and matted and frame on my wall. How very nice. I stumbled upon your Botany Photo of the Day web site in search of a particular plant, Saruma henryi. What a beautiful photo that I found! I immediately subscribed and it is always an inspiration to start the day checking my emails. Your photo of Jasper National Park brought me back to a great trip I had several years ago through Jasper and other national parks out that way. Outstanding! Thank you for sharing this and all of the other photos. I love to show these pictures to my Biology classes! The light trees (at least in the middle foreground) are Quaking Aspens or Western Balsam Poplar. The conifers I’d guess are mostly a mix of Engelmann Spruce and Subalpine Fir, with some Lodgepole Pine (slightly yellower-green trees, towards front left) thrown in. Hi Jaro — nope, no larches at this elevation. Perfect photo for today and we might see similiar views. We’re heading up to Stevens Pass (in Washington) and hope to do some mushroom hunting at the lower elevations. We’ll be very cautious as we seek Chanterelles. Leave a Reply to Cyndy Henderson Click here to cancel reply.